Take 300,000 computer-controlled mirrors, each 7 feet high and 10 feet wide. Control them with computers to focus the Sun's light to the top of 459-foot towers, where water is turned into steam to power turbines. 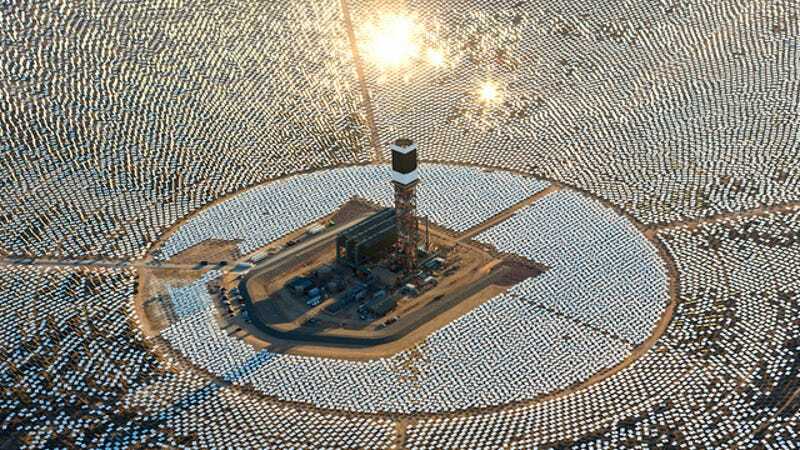 Bingo: you have the world's biggest solar power plant, the Ivanpah Solar Electric Generating System. Long-mired by regulatory issues and legal tangles, the enormous solar plant–jointly owned by NRG Energy, BrightSource Energy and Google–opened for business today. The Ivanpah Solar Electric Generating System is now operational and delivering solar electricity to California customers. At full capacity, the facility's trio of 450-foot high towers produces a gross total of 392 megawatts (MW) of solar power, enough electricity to provide 140,000 California homes with clean energy and avoid 400,000 metric tons of carbon dioxide per year, equal to removing 72,000 vehicles off the road.